As a small-space urban gardener, composting was a practice I long though was "off the table" for me. Turns out I couldn't have been more wrong. Not only am I composting successfully in my small urban space, but I'm producing more than I need in my garden! Here are four of my top tips for composting well in a small space. For me, there are two main ways to accomplish these objectives: using compost tumblers or worm bins. Compost tumblers take up a bit less space than your average hot compost pile, but they also create finished compost much quicker, because you can turn and aerate them more efficiently, leading to quicker breakdown of your organic matter. Worm bins, as their name suggests, use worms (usually Red Wigglers) to process food scraps much faster than a hot compost pile. They also take up a smaller footprint. If you have primarily green waste to process, I'd recommend dipping your toes into vermicomposting. If you have both greens and browns, a compost tumbler is an efficient way to generate rich, "black gold" for your garden. If you decide to go with a standard hot compost pile, make sure you are checking the temperature with a compost thermometer at least once per day. In a perfect world, keeping your compost pile at around 140°F for 3 days is the goal. After 3 days, it'll start to cool down, at which point you'll turn your pile to move finished compost out to the sides and bring unfinished materials into the center where they can break down. The better you track the temperature in your pile, the quicker you'll be able to turn your greens and browns into dark, nutrient-rich compost for your garden. And the faster you can make compost, the quicker you'll be able to amend your soil and grow incredible amounts of fruits and veggies. To really super-charge your small-scale composting, try out bokashi composting. It uses an inoculated bran to start to ferment your food waste before it even makes it into the compost pile. In fact, many gardeners will use the bokashi method and then directly bury their fermented scraps in their soil, where they'll break down in a matter of days or weeks instead of the usual months. You can also throw your bokashi compost scraps into a vermicomposting system or your compost pile for even quicker breakdown and inoculation of beneficial microbes. Surprisingly, one of the things I hear from fellow small space gardeners is, "I have the space, but I don't really feel like taking all of my scraps out to the garden every single time I cook." Makes sense! It can be a hassle. The solution is to get a simple countertop compost bin for your kitchen, so you can store a few days worth of scraps and then transfer out into your composting system all at once. This streamlines your cooking and composting processes, and believe me when I say that we humans like to take the easy way out. So why not give mind and body a little break by making the composting job easier? I like to collect about 4 days worth of scraps - any more and they start to rot in the container, which is no good for the smell in my kitchen! Well, there we have it: Four creative ways to make the most of a small urban space, and yet still maximize the amount of compost you're producing. If you do your job right, you won't need to buy too many amendments for your garden, because you'll be creating almost everything you need from materials you'd have otherwise thrown away! Have you ever eaten a paw paw? This unique fruit isn’t commonly seen in stores, because they don’t ship well. However, they are a great fruit tree for urban yards! These handsome trees have a pyramid shape and large tropical-looking leaves in addition to their tasty fruit. Paw paws are similar to a banana in both nutrition and use, but they grow in a much wider variety of climates. If it’s too cold where you live for bananas, it’s likely that you can grow paw paws instead. The paw paw tree has few pests and diseases and other problems. Plus it’s versatile. Not only does it produce fruit, but it is also a host plant for swallowtail butterflies. Another advantage is that they are deer resistant and they can grow in partial shade. When deciding where to plant the trees there are a few things to take into consideration. First, the trees can reach about 20 feet tall when fully grown. Look up and make sure to site your trees away from any overhead power lines. Next, check to make sure there are no power lines or pipelines where you are planning to plant to the tree. If you’re not sure where underground pipes are on your property, you can usually call your city and they will send someone out to mark it for you. Third, consider shade and sun. Paw paws do well in partial shade or full sun, but you’ll want to avoid complete shade for them. Also consider where they will cast shade once they will grow. Will they shade other sun loving plants? Block solar panels? Or perhaps you can use these attractive trees to passively cool a warm west wall of your home or add to a small garden oasis. If you know someone who has a paw paw tree, you can grow your own tree from the fruit. The seeds will require 100 days of cold before they will sprout. If your climate is too warm for that you can stash the seeds in an unused corner of your fridge. (Am I the only one with a seed shelf in my fridge?). Just don’t let the seeds dry out during this time. A good way to store them is in a Ziploc bag with a damp paper towel. If you are growing your tree from seed it will take a few years before your paw paw tree will bear fruit. If you plant transplants you will be able to harvest sooner. Paw paws tend to ripen near the end of summer or beginning of fall. The fruit grow on the tree in clusters and may become lighter when ripe. The best way to tell it’s time to harvest the fruit is your paw paw fruit should smell pleasant and fruit and be slightly soft (think of a ripe peach). Once you harvest them you can use them as you would bananas. They can be added to smoothies or other desserts. You can eat it straight with a spoon or even make a cream pie! Being able to harvest this unique and yummy fruit is one of the benefits of growing your own fruit trees! In our part of the Midwest, today’s March wind is up to its usual tricks…it teeters between blowing fiercely across the open fields that surround our old farmhouse, then subsiding for a bit, only to turn abruptly, change direction, and begin to race toward the woods. It’s one of those winds, that despite its chill paired with droplets of cold rain, (droplets that our local forecast says will turn to flurries today), still carries the promise of spring. After all, it’s late March, and the hints of springtime are beginning to emerge. There are the green shoots of chives peeking through the soil and just the tips of daffodils that soon will life our spirits with a pop of cheery yellow. A day like this, even though the wind is blustery, is a fine time to dream of springtime gardens. Today I’m curling up with a notebook, a cup of herbal tea, and making plans for some old-fashioned gardens. It’s fun to sketch out some ideas and make a plant list…going to the nursery is always a simple pleasure I look forward to. I’ve gathered a brainstorming list of ideas and plants I want to try…just maybe you’ll find something to add to your own gardens! Plants that seem to shimmer in the moonlight: silver queen artemisia, silver king artemisia, lamb’s ears, silver tansy, silver sage, silver thyme, grey santolina apple mint, lavender, yarrow, oregano, nutmeg, geranium, and yarrow. A place for butterflies to find the sweet nectar they need for food. Plants to consider: petunias, sweet William, primrose, phlox, goldenrod, white daisies, cosmos, coneflowers, white alyssum, catnip, pincushion flowers, sweet rocket, and butterfly bush. I planted a bee garden a few years ago, and it was amazing to see the bees visit knowing they were working their magic on both my vegetable garden and fruit trees! It’s so easy to dry these flowers! They can be added to a grapevine wreath or gathered into a bundle hanging upside down for a primitive look. Herbal tea blends from your own garden…you’ll KNOW they’re organic! I have an area right outside my kitchen door…oh-so easy to snip fresh herbs whenever I’m cooking. Snip bouquets and tuck into Mason canning jars on a picnic table…a pretty way to keep those little critters away naturally! Also known by our kids, for fun, as a Billy Shakes Garden, these plants have been mentioned in Shakespeare’s writings. I hope you’ve found some inspiration for a fun, new garden plan. In this lion & lamb month, it’s the perfect time to plan for the arrival of spring! A food garden is a cooperative happening between the gardener, the soil, the weather and companion plants. Those companions plants are the icing on the cake — they bring it altogether. This blog is all about them, specifically herbs, and how irreplaceable they are in your food garden (not to mention your life). The reason herbs heal, soothe and boost us is they are packed with essential oils, enzymes, alkaloids, bioflavonoids and minerals. Imagine the benefit to our food plants when grown alongside this richness; and the strength of our soils when all that goodness is recycled back via mulch. Herbs are the ultimate companion plant. Make the most of their gifts by creating a border of perennial herbs around your vegetable patch. This border ticks plenty of boxes — a bounty of herbs for cooking and medicine, a boundary to keep the grass away from your vegetable patch, nectar/pollen-rich flowers for bees and beneficial insects, nutritious matter for compost heaps and best of all, ongoing supply of cut and come again mineral rich foliage for mulch. Vigorous herbs with soft foliage make the best mulch. My favorites are lemon balm, yarrow, borage, parsley, fennel, sage and Mexican marigold. Plant them close together, leaving no room for weeds. Choose herbs that flower at different times of year to spread flowering over all the seasons for the bees. Harvesting the mulch is the easy part. Whip around trimming back lush growth in your herbal border as well as plants that are taking over the paths and encroaching on their neighbors. Break or cut trimmings into 15cm bits into your wheelbarrow as you go. Add in fresh grass clippings, spent crops and any other bits you’ve got, like leaves. Mix it together and spread it on. Mulch is the fastest, easiest route to a healthy soil. The less you disturb your soil, the stronger it is. A pile of mulch is a simple solution for many things — to begin a new garden bed, prepare ground for a fruit tree or rebuild tired soil. Keeping your soil covered with mulch at all times keeps it alive and moist. Mulch makes getting rid of weeds an easy job; simply dollop mulch on top of them. I decided to have a go at growing my own mulch because it was costly buying in enough to support my mulch obsessed gardening style, and because there’s no labeling requirement for mulch, I had no way of knowing what pesticides and herbicides had been used. I also felt better feeding my soil a mixture rather than one type. My first batch of home-grown mulch felt really good — I knew I was onto a good thing, and I haven’t looked back! As well being 100 percent organic and free, that yummy mixture supports a broad range of soil life for stronger soils. Home-grown mulch is so vital! Money can’t buy the kind of fertility that recycling mineral-rich herbs back into your garden brings. Green thumb or not, there is one house project you should seriously consider tackling this spring—growing indoor plants. At some point or another you have probably toyed with the idea of adding some foliage to your interior. There’s just one problem: you can barely keep a store bought bouquet of flowers alive. But that doesn’t mean you can’t exercise your green thumb this spring. We’ve come up with the fool proof beginner’s guide to growing indoor plants this spring. All it takes is a little sun, water, and willingness to learn! There is science behind why we feel at peace in the presence of nature. Same goes for why we feel the tranquility of a space laden with plants. Multiple studies have found the presence of potted plants has been shown to reduce blood pressure, lower anxiety, and increase feelings of serenity. Plants are hard workers and do the exact opposite of us—absorb carbon dioxide and release oxygen. This not only freshens up the air, but it also cleanses it of harmful toxins. In fact, one study by NASA found houseplants can remove up to 87% of air toxins over a 24 hour time period. Yes, it’s true. Plants can help you breathe and sleep better. Actually, the reason plants improve sleep quality is because of their ability to replenish oxygen. If you are struggling from sleep caused by an uncomfortable mattress or racing thoughts, adding some foliage to your bedroom might help assuage the problem. Are you convinced you should be growing plants yet? Hopefully, the answer is yes. If so, here are five easy specimens to try your hand at growing. Succulents are one of the most popular, low-maintenance, eye-pleasing plants you can add to your home. With a lot of sunlight and a little bit of water, you are sure to see success growing succulents. But although they are pretty self-sufficient, they still need some attention every now and then. Pot your succulents in well-draining soil and place them in a spot that gets direct sunlight, preferably up to eight hours a day. Water every week or a few days after the soil dries. One popular species to grow is aloe vera. Aloe is just as low-maintenance and also has medicinal benefits you can take advantage of by having it on your home. Pothos is a popular house plant because it is nearly impossible to kill (which is exactly the type of plant beginners want to grow)! This plant prefers low, indirect sunlight which makes it a great option for most anyone to grow. Plant pothos in potting soil and water w every so often when the first two inches of soil become dry. Peace Lily is a popular indoor plant because of its striking blooms and the fact it thrives in bright, indirect sunlight. This indoor beauty prefers a warm, humid environment so avoid placing it in drafty areas of the house. Due to its powerful toxin filtering ability, peace lily is especially beneficial for improved indoor air quality and sleep. Also known as a “ribbon plant” during the Victorian Era, a spider plant is another good option to consider adding to your home. Spider plant thrives in indirect sunlight and only needs moderate amounts of water. Just make sure it’s planted in well-draining potting soil. Like peace lily, spider plant is known for its air-purifying properties so if you are looking keep your home’s atmosphere fresh, give this plant a shot. If the name of this plant is any indication of its resilience, all us aspiring gardeners are in luck. The good news is that it’s name isn’t a coincidence. In fact, it received the label “cast iron” because it can survive in the worst conditions, including outdoors in deep shade and poor soil. This is the type of sturdy plant beginners should definitely give a try. Cast iron plant prefers low light, occasional watering and a variety of temperatures. This plant, like the succulent, does well when left alone so it won’t demand too much of your attention. All in all, if you are looking for a new hobby to learn this spring, mastering the art of indoor gardening is a great way to both revamp and cleanse your interior while simultaneously improving your health. Go ahead, get planting! No greens for your smoothie? No problem! Do you have wilting herbs in the fridge? What a waste of money. Try a trendy kitchen garden, it’s easier than people think. There is nothing to it but to do it, the experts say. “A plan is not necessary. Start small. Grow what you are going to eat in the kitchen,” Susan Brown, Consumer Horticulture Agent for New Hanover County, North Carolina Cooperative Extension, suggests. By following a few simple steps and making the right choices for your garden, you will be harvesting tender greens in a couple months. 1. It’s all about the SOIL! 2. Step away from the hoe; novice gardeners should start with containers or an easy-to-build raised bed. “It can take years to build the soil so it retains moisture and encourages microbial activity when gardening in the ground,” Brown says. Brown and LaMar both suggest that beginners use containers or raised beds. “Use well-draining containers,” LaMar recommends. Without proper aeration and drainage, the plants can get root rot, a soil borne disease or fungus, she says. Drainage is optimal in a simple raised bed built from four pieces of untreated wood. 3. You’ve got the container, you’ve got the soil. All that is missing is the plants! A gardener can “direct sow” seeds or plant “transplants”, which are already started before they get to their growth destination. Some seeds, like root vegetables, should always be directly sown in their final dirt home. Other plants, such as tomatoes, thrive in a garden once they’ve been nurtured as a seedling and ready to transplant. “Grow what you eat,” LaMar stresses. Brown maintains that plant choice is a predominately important factor in successful gardening. “Start with easier plants first and get some experience behind you before you try more challenging plants,” she recommends. 4. Timing is everything when it comes to the garden. Plants are fussy and are subjective to the “Zone” in which they are planted. Brown and LaMar are garden experts on separate coasts and both maintain the importance of zone-based planting advice. LaMar suggests using the USDA Plant Hardiness Zone Map to determine your planting zone. Most seed packets and transplants have Zone information on the label, stating when it safe (warm enough) to plant them. Another great resource for all things gardening, including when to plant, is the local cooperative extension office, Brown recommends. Plants are basic; they need sun, water and food (fertilizer). “Plant conditions vary based on the type of plant you are planting,” Brown says. Each plant or seed packet will be labelled with its sun needs. To determine just how much water a plant needs, or if its deficient or being overwatered, LaMar says the “finger test”. “Put your finger in the soil. If it is wet up to the second knuckle, no need to water.” Overwatering is a big mistake, she says. Watering too much will wash away nutrients and rot the roots. 6. The final step is the most delicious; harvest and feast! Heed the picking advice from the master gardeners and don’t cut the entire plant if you want continual grown (as with greens and herbs.) You only have one shot with other plants, like carrots and beets. Once you pull them, their next stop is your stomach. Incorporating plants into your interior design is a great way to add life and beauty to your home. Nothing can breathe life into a room quite like a flowering plant or bouquet of fresh flowers. Botanicals not only add a burst of color, but they also add fragrance. Using trending colors, like Pantone’s Color of the Year is an instant way to upgrade your home. The color that sets the tone in the fashion industry this year is Living Coral, a vibrant yet mellow shade that warms up your surroundings. Consider these five florals to incorporate Pantone’s Color of the Year into your home. Columbine is a unique coral-colored plant features interesting shaped blooms. This sturdy stemmed flower offers double blooms and would look great on top of a dresser or side table. Place a pot of Columbine in a shady spot that doesn’t get too hot. If you decide to transplant a potted flower outside this spring, make sure you plant it in soil with plenty of drainage. You may also want to mix some compost into the soil. Since it’s a perennial and common native flower, it will flourish year after year. Add a touch of Living Coral color to a bedroom with a Salmon Pearl colored tulip in a bud vase. Its light pink hue and coral petaled edges give the room a soothing feeling. You could also place them in an entryway or on a sofa table to accent the Living Coral within the room as well. Whether in a vase or potted as a shrub, roses never disappoint. The Coral Knock Out Rose is part of a new line that offers saturated color. Plant this variety outdoors and then bring in cuttings for the kitchen or master bedroom. These roses will add a touch of elegance to any room. The plants can grow up to 4 feet tall and wide outdoors making them an excellent choice if you want to add some Living Coral to your yard. 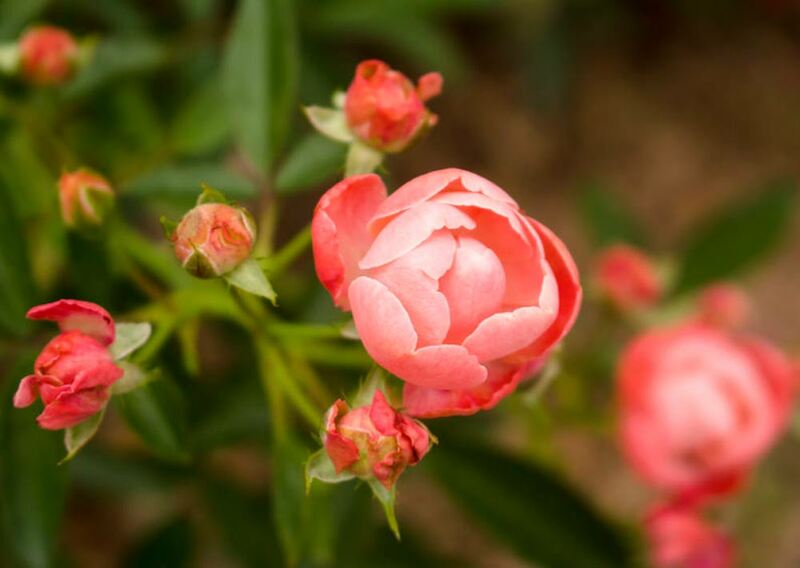 With proper care, these roses will continue to bloom in your garden for years. If you’re looking for a coral flower that would do well in a bathroom, look no further than this Canna Lily in ‘Toucan Coral’. Known for tolerating heat and humidity, Canna Lilies will stand up to the conditions of any bathroom. This long blooming plant will reach about 2 feet tall when planted indoors. You do need a bathroom that gets sunlight for this plant to thrive. This plant is also a good option for smaller backyards and a great choice for those tighter spaces within your home as well. This beautiful flower offers single blooms that would look great on a kitchen counter or dining table. Dahlias in the ‘Belle of Barmera’ shade do well in containers. The flower offers large single blooms that pack a punch of color to any room. We love the stunning look of dahlias with their ragged edges that resemble a mix of carnations and roses. Pantone’s Color of the Year is an easy one to incorporate into your home and into your landscape. When you’re ready to change your inside decor, all these will spruce up your garden and add curb appeal to your home. You'll find the Living Coral hue in many florals as well as plenty of home décor. Add one or all these five florals to incorporate the Pantone color of the year into your home.